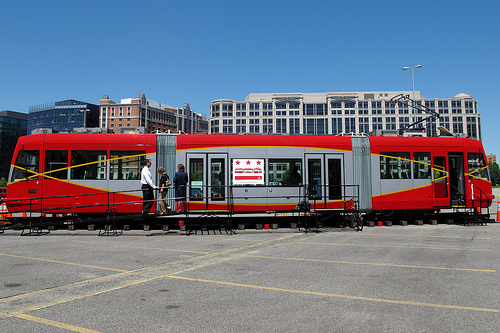 DDOT released a fairly large report on Tuesday about DC’s Streetcar Plan. There is not a whole lot of mention beyond H St, NE, Benning Road and the Anacostia Lines. So my question to you guys is – do you think a streetcar will ever be built on Georgia Ave and 14th St, NW like we’ve heard mentioned in the past? If so what in what time frame? Do you think operations starting in 2012 sounds realistic for H St, NE? If not what year do you really think it’ll start? Do you think this system will face debt problems like WMATA is currently facing? What do you think would be a good price for a one way fare? Do you think the construction of the streetcar project is a good use of city/federal funds? Ed. Note: Sorry for the million questions – they were all just banging around in my head. Obviously feel free to pick and choose which questions are of interest to you. Personally I’m excited to see how the H St, NE line turns out. I think if it is successful it could go a long way towards encouraging expansion in other parts of the city as well. After the jump you can see the summary of DDOT’s plan as well as a link to the full report. The District Department of Transportation (DDOT) has presented an updated comprehensive DC Streetcar System Plan to the DC Council for review and approval. The plan details DDOT’s plans for the design, construction and operation of the system and covers topics such as operations, safety, fare collection, and funding. The document specifies how DDOT plans to complete the two streetcar lines already under construction, the H Street/Benning Rd Line and the Anacostia Initial Line Segment, and lays out the plans for additional extensions in Wards 7 and 8. It also includes the completed DC Transit Future System Plan – the District’s first comprehensive streetcar system plan. DDOT is planning a 37-mile, 8-line streetcar system with service across the city. The plan was transmitted by the Mayor last week and formally introduced today by the Chairman of the DC Council on behalf of the Mayor in accordance with the requirements laid out in the Fiscal Year 2011 Budget Support Act. Approval of the DC Streetcar Plan by the DC Council will release $34.5 million in capital funding for the current H/Benning streetcar project. The complete plan is now posted on DDOT’s website at ddot.dc.gov/DCStreetcar.